Vaccination is a crucial weapon in the fight against child mortality on the continent. Chances are good that, if you grew up in a middle-class environment, you will remember being vaccinated as a child. A nurse – perhaps friendly, perhaps not – gave you a ‘shot’. At the time, you would have thought of it purely as medicine, a necessary evil to be endured, if for no other reason than because ‘mom said so’. But with age and understanding, it is difficult not to marvel at the medical technology that has given us the class of preventative medicine called vaccines, and the impact they’ve had on humanity. Today, many diseases that (literally) plagued humanity sound downright medieval, such as smallpox, polio and yellow fever. They were once a lethal reality for people – and not as far back as you might imagine. Smallpox was officially eradicated only in 1979 after a 10-year vaccination campaign by the World Health Organisation (WHO). The disease once threatened over 60% of the global population and killed about 30% of those infected. Polio infections have fallen by 99% since 1988, and early last year the WHO reported that, due to increased vaccination, the number of measles deaths globally between 2000 and 2011 had fallen by 71%. Vaccines are usually administered in early childhood, at an age when their immune systems are most vulnerable. Administration involves injecting a dead or weakened version of the bacteria or virus that is being vaccinated against, which stimulates the immune system to produce protective immunity such as antibodies. The result is that you’re far less likely to pick up an infection from that particular germ because your immune system is prepared to mount a defence against it. Thanks to vaccines, protection against highly contagious communicable diseases is all but taken for granted in developed nations (HIV being the obvious exception). Ironically, this may be a contributing factor to the rise of the anti-vaccination movement, based on a now thoroughly debunked scientific paper published in 1998, which claimed that a link existed between autism and the MMR (measles, mumps and rubella) vaccine. It’s believed that the outbreaks of whooping cough, mumps and measles that have begun to spread throughout the US are due to parents choosing not to vaccinate their children. This is an excellent illustration of why – even after a disease has been virtually wiped out and there appears to be no threat – vaccination is still vitally important. ‘Vaccines have been incredibly effective at virtually eradicating or reducing the burden of diseases that used to ravage the human population,’ says Dr Thomas Scriba, immunologist and deputy director of the University of Cape Town’s South African TB Vaccine Initiative. ‘If a sufficiently high vaccination coverage is achieved, then the infectious organisms cannot effectively circulate throughout the human population, and even persons who did not receive the vaccine will be “protected” because the bugs are not transmitted to them. Since many diseases have virtually disappeared from the globe, some interpret this to mean that vaccines are not that important anymore. Unfortunately, in many third-world countries – mainly in Africa and Asia – the coverage is not sufficiently high, and vaccine-preventable diseases are a daily reality, particularly among rural populations and those living in townships and urban slums. Vaccines are not reaching those most vulnerable, due to a combination of ignorance, living in remote locations, poor infrastructure, insufficient funding and ineffective government policies. ‘One of the biggest obstacles to the roll-out of effective vaccination programmes is inadequate knowledge of vaccines and their relevance by both healthcare workers and the public,’ says Dr Benjamin Kagina from the Vaccines For Africa (VACFA) initiative at the Institute of Infectious Diseases and Molecular Medicine. ‘Anti-vaccine campaigns and negative rumours about vaccination are challenges in South Africa and Africa in general. Inadequate human and financial resources also rank highly among the challenges the continent is facing with vaccination programmes.’ The most commonly administered and perhaps most important vaccine is for measles. ‘The measles virus kills many people globally,’ says Scriba. ‘Our EPI [Extended Programme for Immunisations] schedule in South Africa, which is in line with WHO recommendations, prescribes vaccinations against measles at nine and 18 months of age. ‘The tuberculosis vaccine BCG [Bacille Calmette-Guerin] is also extremely important: it saves thousands of lives because it prevents severe forms of TB in babies and young children. However, it is not sufficiently effective at preventing TB in adolescents and adults, and therefore is not as effective as we would like. According to Kagina, national immunisation schedules for most African countries include the measles vaccine, BCG, OPV (against poliomyelitis), DTaP (against diptheria, tetanus and pertussis), Hib (against haemophilus influenzae Type B) and HBV (against hepatitis B), in accordance with WHO guidelines. Yet about 2.5 million deaths a year are caused by vaccine-preventable diseases – mainly in Africa and Asia among children who are younger than five. 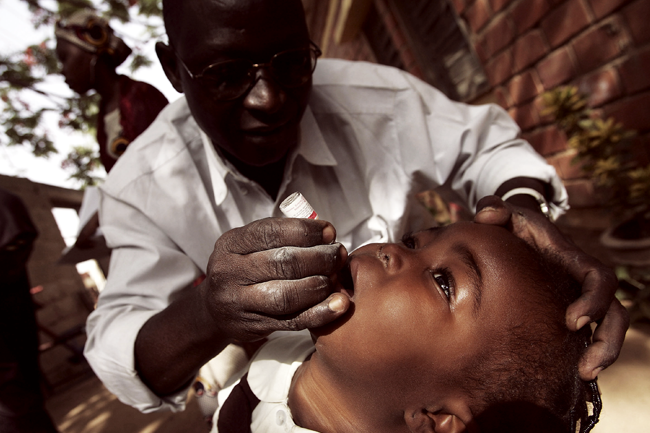 It’s estimated that 7.8 million children in sub-Saharan Africa do not have access to basic immunisation services. According to VACFA, most children in Africa have access to only six to eight vaccines, while a child born in a developed country, such as the US, has access to over 16 vaccines. There has been much in the media about the outbreak of ebola in West Africa – and with merit: it is a horrific and often fatal disease for which no licensed vaccine or cure currently exists. Yet ebola pales in comparison to diseases such as TB, from which an individual living in Africa is far more likely to die. ‘From both morbidity and mortality data, TB has been and is still a bigger threat than ebola, within Africa and on a global scale,’ says Kagina. Scriba says: ‘More people die every single day from TB, for example, than have died from this latest ebola outbreak in West Africa. The same goes for malaria and HIV.’ Indeed, TB, HIV and malaria are by far the main infectious diseases that Africa is heavily burdened with at the moment. Not only that: ‘Most viral haemorrhagic fevers, neglected tropical diseases [including rabies and leprosy], as well as enteric [intestinal] diseases are very much localised within the African continent, although some parts in Asia have recorded a few cases,’ says Kagina. Novartis, Merck (MSD), Sanofi Pasteur and Aspen/GSK are just a few of the main pharmaceutical companies that supply vaccines to Africa. However, they manufacture products aimed at treating global diseases. Since it is likely that return on investment will be insufficient, there is little incentive for pharmaceutical companies to develop and manufacture vaccines that may prevent diseases particular to the African continent. One organisation, though, the Meningitis Vaccine Project (MVP), is working to eliminate a strain of meningitis that is only present in 25 sub-Saharan African countries that make up the ‘Meningitis Belt’. According to the WHO, about 450 million people living in this region are at risk of epidemic meningitis each year. Formed around 2001 with seed capital donated by the Bill & Melinda Gates Foundation, MVP is the first organisation to conduct medical research into developing a vaccine to combat a disease endemic to Africa. The good news is that it has succeeded: recently it developed a vaccine that is now ready for widespread distribution in Mali, Burkina Faso and Niger. It’s encouraging that in almost all African countries that have functional WHO EPIs, vaccination coverage has improved since EPIs were introduced in 1974. Furthermore, all Central African countries have been approved for support by the Global Alliance for Vaccines and Immunisation (GAVI), and new vaccines (for hepatitis B, haemophilus influenzae, meningitis A and human papillomavirus (among others), are being introduced across the continent. However, there are still significant challenges to overcome. According to a report titled Strengthening the Expanded Programme on Immunization in Africa: Looking beyond 2015, published in medical journal PLOS Medicine by scientists from VACFA, there are still wide inter- and intra-country differences in vaccine availability. A need for increased political and financial commitment from African governments for both maintaining current achievements and making additional progress for EPI in Africa was also identified in the report. Often unreliable immunisation data is also a threat to effective EPIs, as is a lack of funds to procure vaccines. Ensuring a secure cold storage transport chain has also proved challenging, as vaccines need to be kept at a certain temperature to remain effective. That said, there is plenty to be hopeful about. Poorer countries are receiving funding from organisations such as GAVI, and ‘we are seeing much more vaccine production in the developing world’, said Dr Thomas Cherian, who co-ordinated WHO’s EPI from 2006 to 2012, in a recent WHO report. ‘China, India and Indonesia are all supplying vaccines that are of an assured quality and are pre-qualified by WHO.’ To paraphrase Cherian, where there is a political will (coupled with investment), there is a way to provide vaccines to Africa’s children.